I am first time gardener. I did lot of research, it looks like i have pinworms attacking my plant. 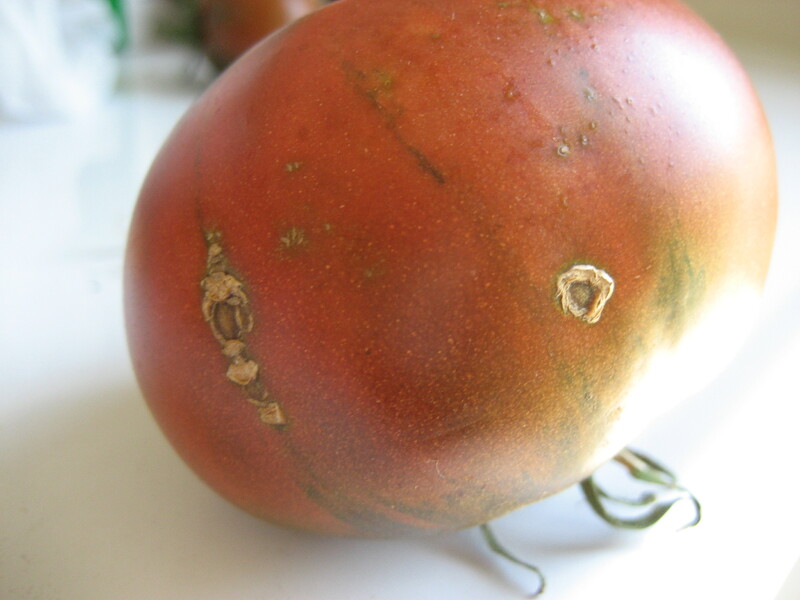 I have seen hole in tomatoes and seen small worm /caterpillar in leaves. I have culled a lot leaves. I live in central NJ zone 7a. My question is 2 part. Is it worth it to buy Bt to kill the worms now? i have a few tomatoes that will take couple of weeks to ripen. I have learned a lot this yea between deer eating my plants, ground hog eating my tomatoes and now pinworms. You probably have tomato leaf miners -- I do too. They are moth caterpillars that burrow between top and bottom cells of the leaves. Most insecticides including Bt is ineffective because they are INSIDE. TRY TO CLIP OFF damaged leaflets. Don't use insecticides which will kill off predators like spiders. Encourage spiders and minimize destroying spiderwebs -- they will catch the adult moths. You can scratch around the soil at base of the plants where the mature caterpillars drop off to pupate -- this will expose them to birds and other predators. Keep an eye out also for hormworms, army worms, and climbing cutworms. Bt can be effective for those though I don't use it. Try to inspect developing fruits daily or at least every other day, especially after they start blushing and , if in doubt, pick any time after blushing -- don't wait for fully ripe on the vine which makes them more likely to be eaten by something. Wrap with paper napkin(s) and allow to ripen in the house. I am sure mine is pinworms. Looking at photos about leaf miners, it is very different. Mine looks like the above photos. Well, they are very similar in appearance, life cycle, and the way they mine inside the leaves. So my suggestions above are still valid. I'm encouraged to see that they are susceptible to predatory wasps. I do have the occasional stem end-burrowed fruits -- they are easily cut out without significant loss (usually just in the pithy core) unless they manage to get WAY inside the fruit. I've had that happen with over abundant harvest and insufficient monitoring of the harvested fruits. Bottomline and basic rule -- cut open and use any fruit with any hole in it right away. Leafminers seems to draw/carve a path on a leaf. Like the picture below. Whereas pinworms tend to make blot of white(no chlorophyll) and shriveled leaf. Correct me if i am wrong, i am just gaining info by googling. Not everything on the internet is correct!. There are two kinds of pests that are called leaf miners. One group are flies and their maggots make those wiggly tracks you linked -- I believe usually vegetable leafminer (Liromyza sativae), but there are other species like spinach leafminer (Pegomya hyoscyami) that attack other kinds of veges. Also citrus leaf miners for example. The other kind are moths like the Tomato leaf miner moth (Tuta absoluta) and the pinworms you mentioned. -- I learned something new, too.